Late last week I was perusing the pages of a New York opera site, and I discovered an article that was a review of a book about the art and critics of the New York opera scene. What surprised me (but probably shouldn’t have, was the sheer volume and heat of the anger at critics. All the old saws were there: only failures are critics; critics never added any value to anything, and one particularly harsh missive that argued that any critic who was unable to perform at the level of the artist he critiqued had no credibility. Which, of course, is so much rot. Now, I can’t paint, draw, sculpt, make a movie, write a song, or design a building. But I do write, and I have taken no shortage of verbal double-ought buckshot for my writing from people who cannot themselves assemble a coherent sentence. What is in question, though, is not their ability to write, but their ability to read, and if someone can read, he can critique a writer. If they could not (or did not) read, they’re disqualified, but only then. The same, I would argue, applies to any art. So while some critics can be insufferable (and some artists can be divas,) to suggest that one must be an artist or have an artist’s talent in order to critique art is so much elitist hogwash. It delegitimizes the opinion of everyone but a closed coterie of talented specialists who (I would argue) are more likely to engage in critical back-scratching (“if I go easy on him, he’ll go easy on me”) than someone without that kind of skin in the game. What is more, that sort of intellectual snobbery seems somewhat antithetical to a democratic nation, one whose society is built on the presumption that everyone’s choice – and by extension, opinion – is of equal value, if not of equal merit. And don’t get me started on the importance of some undefined level of expertise: it was a child that pointed out that the emperor was naked, not a fashion designer. Finally, I think we need to admit that critics have a great value if we both recognize their strengths and their limits. Critics have been instrumental (pardon the pun) to my musical growth and appreciation – I would be much more of a tyro than I am today without them. If there is one message we must comport to noobs and aficionados alike, it is this: a critic is entitled to his or her opinion, but he is not entitled to yours. Read, learn, then go listen/look/watch with an open mind. I would hardly call myself a learned patron of art. At best I am a student, and a very lowly student at that. I would have a hard time explaining the difference between Modernism and avant-garde. I haven’t even read Dwight Macdonald. But I know what I like, and for some reason Andy Warhol’s work has never done much for me. 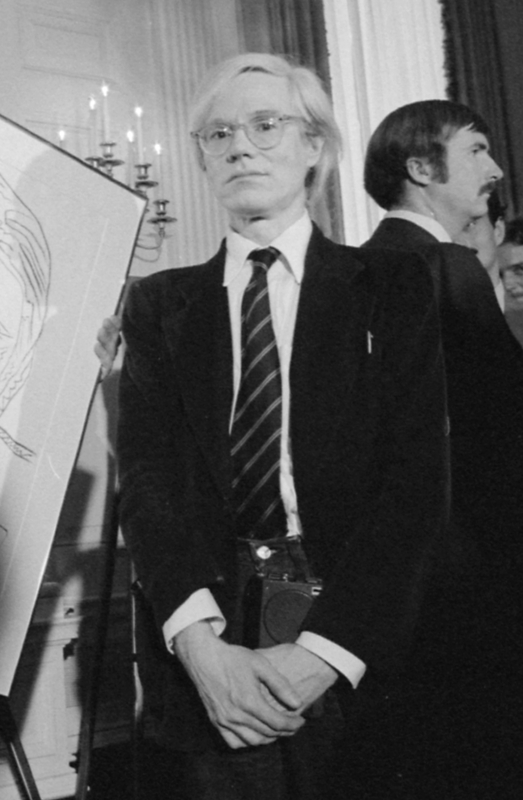 I am not sure why, but for as long as I can remember something in the back of my brain has always wrestled with the suspicion that everything Warhol did was, at some level, a put-on. He always seemed more concerned about the reaction than the creation, as if he was a performance artist and the minds of his audience were his canvas. Or (buying into the put-on, now), maybe I was just too unsophisticated to appreciate the greatness of the master. Possible: the closest I ever got to even taking a course on art or art history was my yearlong freshman humanities course at UCSD. Or maybe, possibly, this emperor was naked, and nobody within non-stop flying distance of JFK had the cojones to stand up and say it. I sure didn’t. On the other hand, Jed Perl, visiting professor of liberal studies at The New School and the art critic for The New Republic, has both the art chops and theintellectual gonads to raise his hand and take on the entire cult of Warholism and try to stuff it back into the bottle. The show is organized thematically rather than chronologically, as if to emphasize Warholism’s status as a wrap-around 24-7 experience. Themes are introduced with tabloid vehemence, the boldface section titles and subtitles hammering us with their relevance. There are sections dedicated to “Daily News: From Banality to Disaster,” “Portraiture: Celebrity and Power,” and “Queer Studies: Shifting Identities.” In each section, works by Warhol are jammed together with works by his contemporaries and by younger artists. Each room feels like a fairly miscellaneous group show, the sort of thing a high-end Chelsea gallery might put together during a slow month, with a Hirst from stock, a Ruscha borrowed from the gallery next door, and a Warhol borrowed from a collector who is considering selling. Perl concentrates his critique on the “Regarding Warhol” exhibition at New York’s Metropolitan Museum of Art. Rather than stop at the show itself, however, he makes of it a platform from which to begin a deconstruction of “Warholism,” the quasi-movement of artists that has risen like a foam in the wake of Warhol’s passage. To a novice like me, the deeper Perl goes, the more all of this starts to sound like a bunch of art critics whacking each other with hardcovers of their latest collections of essays. Yet it is all strangely comforting. I feel vindicated. I feel like I have been released from some intellectual prison, free to stand on a desert cliff and unleash a manifesto. I want art that challenges me without questioning my intellect, that moves me without stirring my base urges, that lives as both testament and artifact. I want art that invites me to learn more as I enjoy it, not art that demands an M.F.A., a subscription to Wallpaper*, and an addiction to Galois cigarettes just to “appreciate” what is being “said” by the piece. And to all of you Macdonald fans, I don’t want my art watered down, vulgarized, cheapened, or shrink-wrapped. You can stick your “mid-cult” and “middle-brow” epithets up your aesthetic sensibilities. You don’t need to bend over to make art accessible to people like me. You just need to leave a footstool or a stepladder lying around so we can raise ourselves up to see.